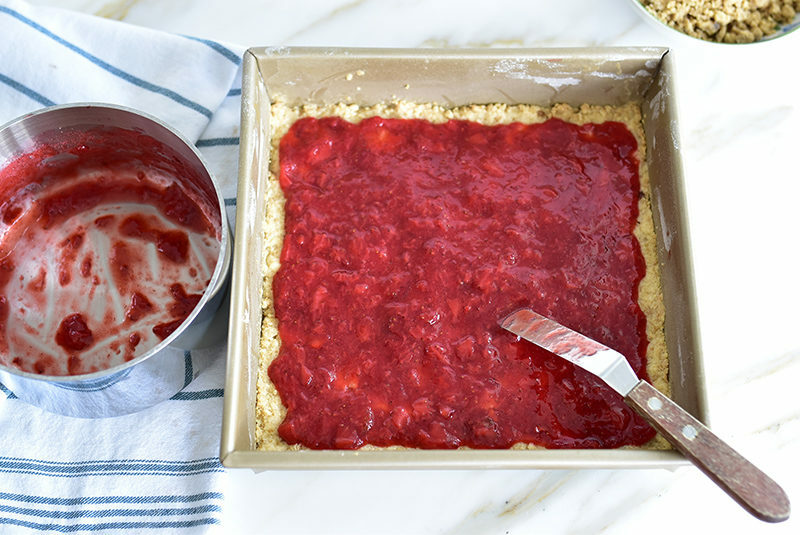 The jam used for Strawberry Jam Bars is a quick-method, just cooking down berries with sugar and lemon juice. Rose water takes the jam to another level of luscious, and the lemon gives the perfect sweet-tart balance. 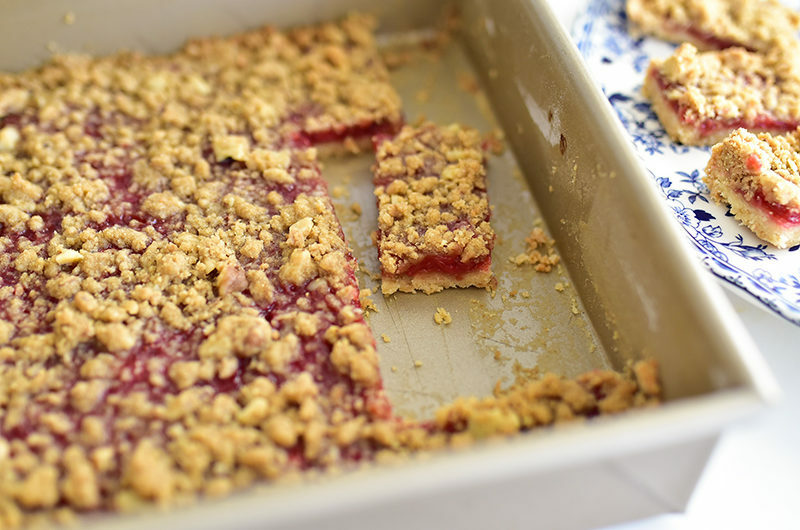 Strawberry Jam Bars are right at home at a picnic. If you want to use prepared strawberry rose jam, try this beautiful jar from Maureen Abood Market! 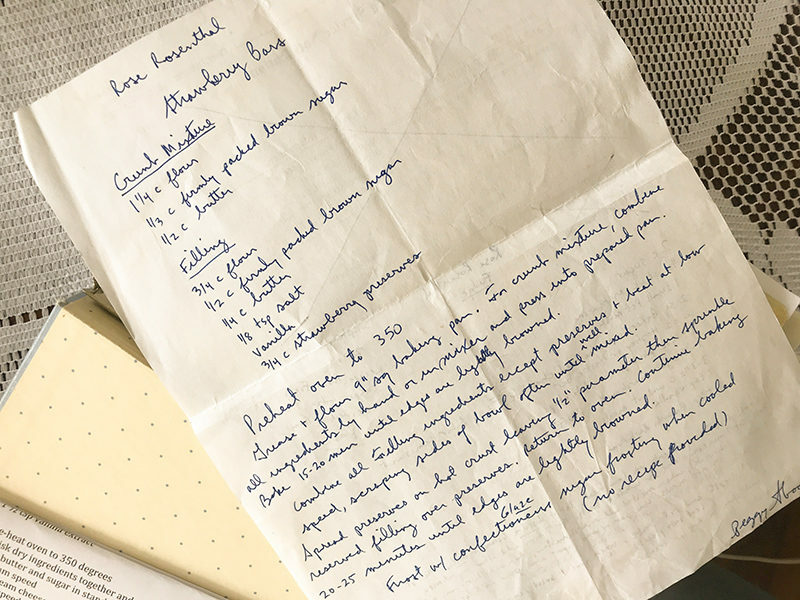 When I recently thumbed through my mom’s file of loose recipes, written on their various vintage papers and recipe cards in all of the different handwriting of the recipe-giver, I was struck by the number of recipes that came from neighbors. Neighbors of her own mother back in Ohio, neighbors on Wagon Wheel Lane, and on Main Street. I started to get real anxious about my own loose recipe file. That file is a collection largely of recipes I was lucky enough to inherit from Sitto’s kitchen, and recipes I collect. Or used to collect. Correction: it’s not that I don’t collect recipes! We all collect tons of recipes all of the time. But the lion’s share of them live online, on Pinterest or among the unnatural number of tabs I keep open in my browser at any given time, in an effort to hold the page until I can get back to it. When I taste a glorious dish at the house of a neighbor and ask could I have the recipe, it’s more likely that they’ll text over a much-appreciated link the next day than they will write out the recipe on a recipe card. Best thing to happen to me in recent years was my mother-in-law asking for the recipe for a chicken dish I had made for her, for which there was no real recipe written down. I took to a recipe card and wrote one for her, which was perfectly natural to her. And to me felt delightfully old-fashioned. My sister found her way to this strawberry jam bar recipe, given to her by my mom’s neighbor Fran, who’s been my mom’s neighbor her entire adult life (who among us gets to have that kind of experience anymore? Few, very few). Peg didn’t snap a photo of the recipe like I probably would have, for ease. No. She wrote it out on any piece of paper she could find at that moment, and folded it up for safe keeping. Fran got the recipe from her neighbor up north on Main Street, who in turn was our neighbor too, across the street. Rosie Rosenthal owned the dry good store just a couple of blocks down Main Street from her own house and also knew how to make a very good jam bar. I imagine Rosie made these bars for a lot of years, took them to picnics and passed them around out front during the parades for Memorial Day and Fourth of July there on Main Street. I like to imagine that Fran ate one out on the lawn, and when she asked Rosie for the recipe, she found a neatly written card in her mailbox next day. The fact of a food blogger longing for the lost art of the recipe card is, I know, kind of funny. I love sharing recipes the way we do here. But I do love a good worn card in the hand, and the deliciousness the recipe promises for having been written down to share. 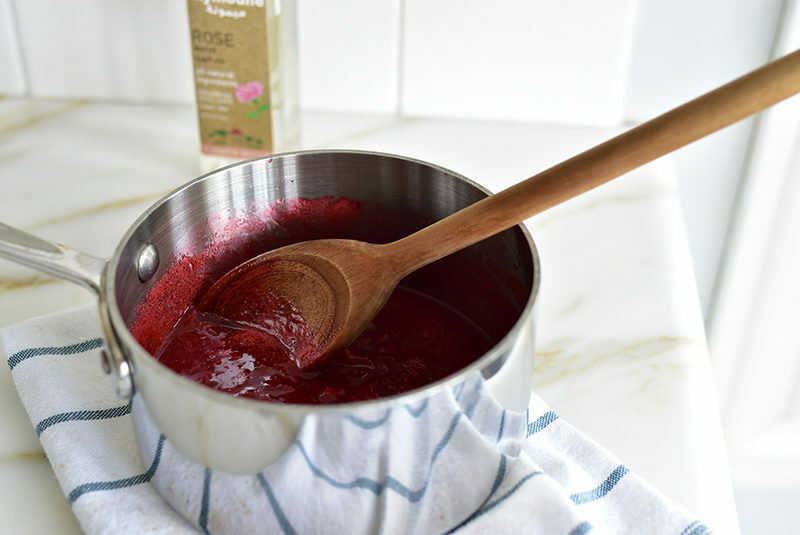 And I do love to tinker, so admittedly, I’ve tinkered with Rosie’s original recipe, which does not call for the quick homemade jam (it’s just so fresh and flavorful and so perfectly tart!). Also Rosie’s bar has a little more crumb topping than mine. 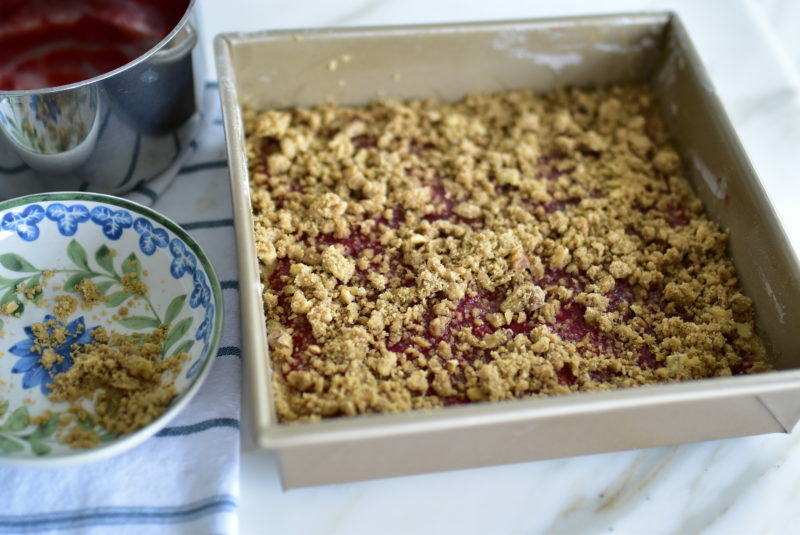 Oh, and I don’t really bake with red berries EVER without adding a whisper of rose water, which is further called for here because, well, Rosie Rosenthal! In Rosie Rosenthal’s honor, we're adding a hint of rose water to her bars. 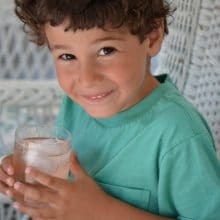 The rose water is a whisper that just makes the strawberry taste that much more . . . strawberry. 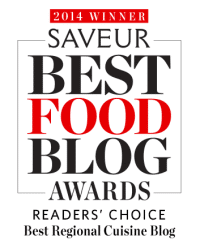 If you’re not making your own jam, use ¾ cup of Maureen Abood Market Strawberry Rose jam! Heat the oven to 350 degrees. Coat a 9-inch square pan with butter and flour. First, make the filling. 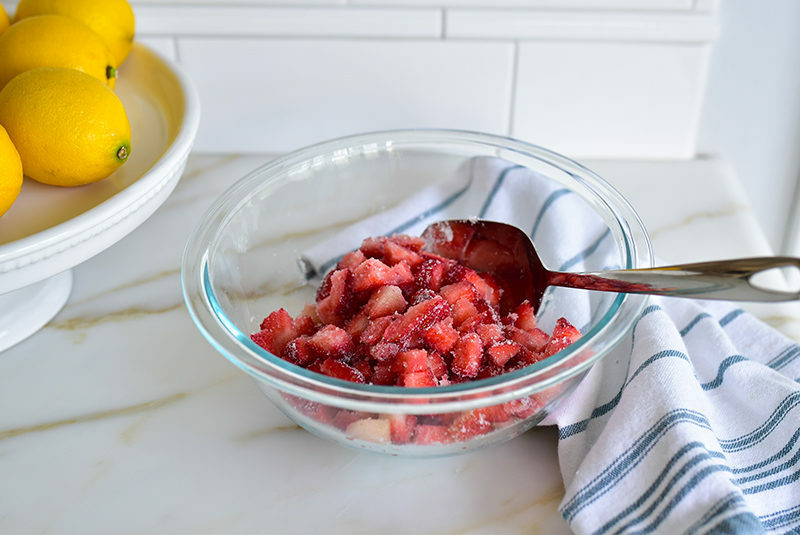 In a small saucepan bring the strawberries, sugar and lemon juice to a rolling boil. Reduce the heat and simmer for about 10 minutes, stirring frequently and mashing the berries with a potato masher. 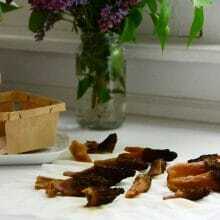 Remove from the heat and stir in the rose water. 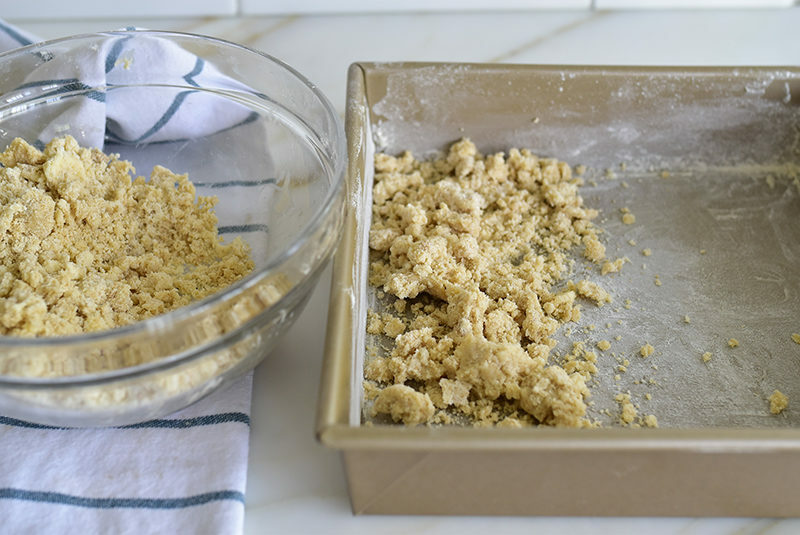 To make the base, in a medium bowl, combine the flour, brown sugar, butter, and vanilla. 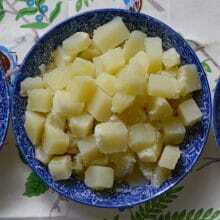 Mix with your fingers or using a pastry cutter or spoon. Press the dough into the bottom of the prepared pan, and bake for 15 minutes, or until the pastry is lightly browned. 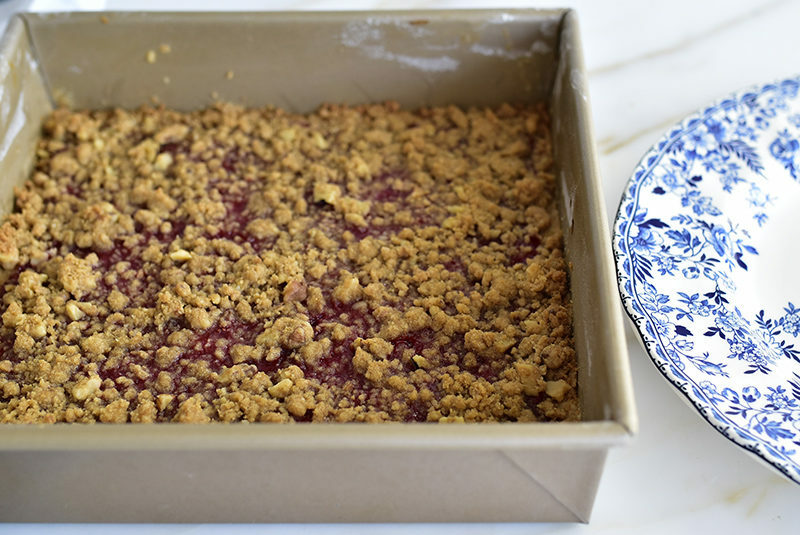 Immediately spread the strawberry filling over the warm pastry base, leaving about ½-inch area bare around the perimeter so the strawberry doesn’t stick to the pan. To make the topping, use the same bowl used for the base. 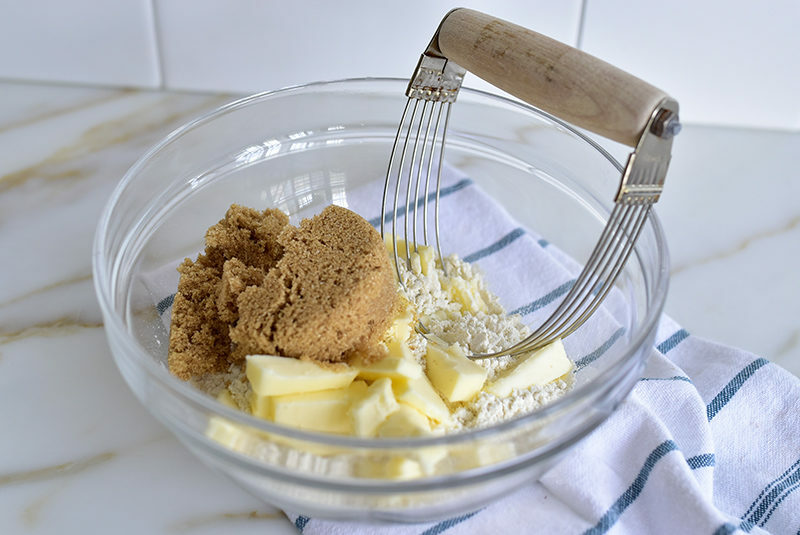 Combine the flour, brown sugar, walnuts, and butter using your fingers, a pastry cutter, or spoon. Sprinkle the topping evenly over the strawberry jam, leaving some spaces open for the red jam to peek through. Bake for another 20 minutes, or until the topping and base are golden brown. Cool completely before cutting into bars. 5 Responses to "Strawberry Jam Bars"
Thanks can ‘t wait. To make it ! Blessings! Is it possible to make a version using raspberry jam for the filling and chopped pistachios for the topping? Oh absolutely, that will be delicious! Maureen, loved these! i’m not much of a baker but sure glad i tried these out. I’m curious if you use this simple jam for any other uses. Thanks for sharing! Oh yes–over ice cream, as a cake filling between layers, for thumbprint cookies (these are incredible)!